BRING JOY FOR EVERYDAY LIFE- MORE JOY is born to bring happiness by design. Beneath the fresh, playful patterns and the modern Scandinavian design lies even more. Above all MORE JOY is a personal messenger to remind us about the most important thing in life- joy. Designed and printed in Finland. Our passion is to combine usability with sensibility and get inspired by the beauty of the northern lifestyle. With MORE JOY we cherish the natural and all the small, precious moments of daily life. Each reusable, washcloth-sized dishcloth replaces 17 rolls of paper towels and is made from natural fibers, 70% cellulose and 30% cotton. These innovative cloths can be easily washed in either the dishwasher or the washing machine over 50 times and are much more hygienic than sponges as they dry quickly. No chemicals are used in the production or printing of our designs. So gentle, they can be used in the bathroom as a washcloth and can clean most any surface without streaking or scratching. MORE JOY- bring joy for everyday life! ENVIRONMENTALLY FRIENDLY - Each 8" x 6.75" reusable dishcloth replaces up to 17 rolls of paper towels, is 100% biodegradable and can be composted after using for 6-9 months. No chemicals are used during the production of our unique kitchen cleaning cloths, making them safe for the environment and for the people who make them. They are the ultimate reusable paper towel! INNOVATIVE- Unlike traditional sponges, our MORE JOY Dishcloths don't harbor bacteria because they dry fully and can be washed over 50 times in either a washing machine or dishwasher. They absorb up to 20 times their own weight in liquid - a brilliant kitchen sponge cloth! Wet then use to wipe down surfaces. When finished cleaning, rinse, squeeze out excess water and air dry. MULTI SURFACE CLEANING - From windows to granite, the gentle fibers of our dishcloths clean naturally without scratching or streaking. Great for RV kitchen supplies! These reusable washcloths can be used with just water or with your favorite natural cleaning solution-easily eliminate chemicals from your cleaning routine! 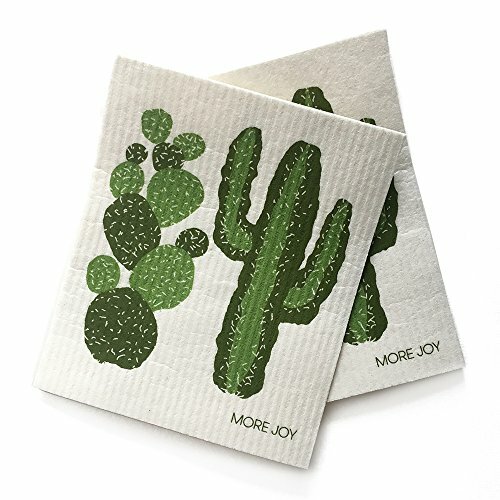 ALL NATURAL - MORE JOY Dishcloths are made of renewable fibers (70% Cellulose/30% Cotton) and printed with eco-friendly water-based inks (not tested on animals). The natural solution to cleaning counters, dishes, mirrors and all kinds of general household cleaning. They are even gentle enough to use in the shower or bath as a washcloth. BRING JOY FOR EVERYDAY LIFE- MORE JOY is born to bring happiness by design. Beneath the fresh, playful patterns and the modern Scandinavian design lies even more. Above all MORE JOY is a personal messenger to remind us about the most important thing in life- joy. If you have any questions about this product by MORE JOY, contact us by completing and submitting the form below. If you are looking for a specif part number, please include it with your message.